European Council President Donald Tusk has explicitly ruled out any EU action over Catalonia, despite the "concerning" situation. "There is no room, no space for any kind of mediation or international initiative or action," he said. He was speaking at a joint news conference with EU Commission President Jean-Claude Juncker. A referendum outlawed by Spain was held on 1 October. Of the 43% who voted, 90% were in favour of independence. Mr Tusk's remarks came hours after Spain said it was beginning the process of imposing direct rule on the autonomous region. "I am of course for many reasons in permanent contact with (Spain's) Prime Minister Mariano Rajoy," Mr Tusk said. "There is no hiding that the situation in Spain is concerning, but our position... is clear." 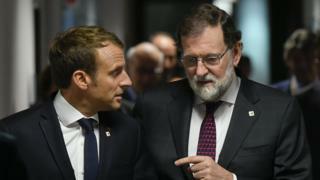 He was speaking ahead of an EU Council summit, but said the issue of Catalonia was "not in our agenda". Other European leaders, including Germany's Angela Merkel and France's Emmanuel Macron, also threw their support behind Madrid. Meanwhile, Russian President Vladimir Putin said the crisis exposed Western hypocrisy, which backs some separatist movements but not others. He argued that Western nations had supported the independence of Kosovo from Serbia - a Russian ally - but not Catalonia or for Iraqi Kurdistan. He also raised the opposition of many nations to Russia's annexation of Crimea from Ukraine in 2014, which resulted in international sanctions against Russia. Spain said it would begin the process of imposing direct rule on Saturday by activating article 155 of the country's constitution. But Catalonia's leader said the region's parliament would vote to formally declare its independence if Spain continued "repression". Spain's supreme court declared the vote illegal and said it violated the constitution, which describes the country as indivisible. But the Spanish government now says it will begin the procedure on Saturday. "No-one doubts that the Spanish government will do all it can to restore the constitutional order," a government statement said. On Saturday, the government is due to decide a list of specific measures to transfer powers from Catalonia to Madrid. The extent of those measures is not yet clear - but could include taking control of the regional police, or even calling a snap election. Xavier Arbós, a constitutional expert at the University of Barcelona, said: "We simply do not know what measures the Spanish government could enact. "We do not know how the powers of the Catalan government could be affected." Spain's Senate, controlled by Mr Rajoy's conservative Popular Party (PP) and its allies, would then have to approve the list. Analysts say Article 155 does not give the government the power to fully suspend autonomy, and it will not be able to deviate from the list of measures. Where does this leave the Catalan leader? After the 1 October vote, Catalan leader Carles Puigdemont signed a declaration of independence, but immediately suspended it to allow for talks. He has warned the suspended status could change. "The Catalan parliament could proceed, if it is considered opportune, to vote on a formal declaration of independence," he said. But if Madrid takes control of the region's finances or police force, or dissolves the Catalan regional parliament, such a vote would be a challenge. The constitution does not put any time limit on the process, however.